Here's another way to get the flavor of a jalapeno popper but without using lots of jalapenos! MLE's Jalapeno Popper recipe is delish but here's another take on the popper that can easily be brought along to parties. You can leave them cold and heat them up at the party! Dice up jalapenos (if your using fresh ones), remove seeds if you don't want your poppers too spicy. In a small bowl add in your cream cheese, garlic powder, onion powder and jalapenos. Mix well. Place 20 - 25 (depending on how full you fill them) wonton wrappers in a mini muffin tin lightly sprayed with oil. The wrappers will spill over the edge a little. Fill each cup with your cream cheese mixture, about 1 - 1 1/2 tbl spoon per cup. 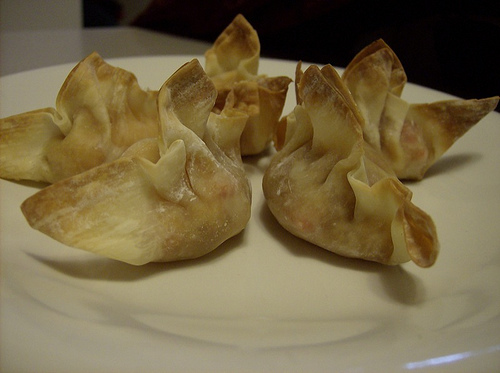 Fold in the edges of the wonton wrappers if you like or leave them as they are over the edge, your preference. Spray with olive oil cooking spray. Bake at 350 for 10 - 15 minutes, just until the edges get browned.